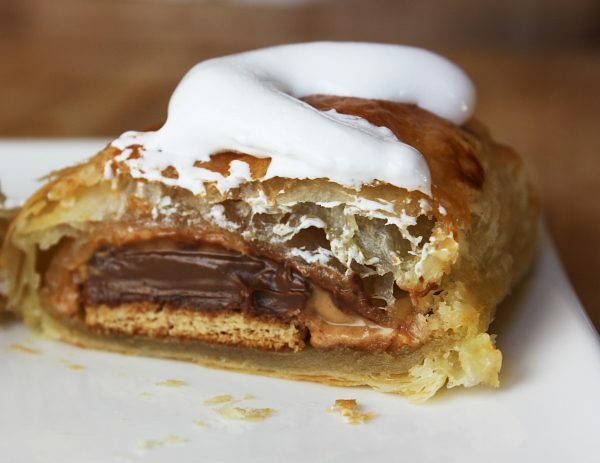 These Peanut Butter S’Mores Turnovers are a delicious combination of chocolate, peanut butter and marshmallow in a flaky puff pastry. Watch the short video showing you how to make this recipe, then scroll to the bottom of this post and print out the recipe so you can make them at home. I’m not much of a camper. My husband often takes my son on camping trips, and I happily stay behind and thank the gods for our bug-free house, cozy bed and well-stocked kitchen. 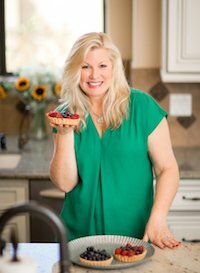 I always send them off in comfort… marinate a little meat for them to throw on the grill, pack up some convenience foods and bake a few goodies too. When they return from their camping weekends, I hear mostly about the evenings sitting around the campfire. Story telling, snuggling in blankets, singing songs and roasting marshmallows for S’Mores seem to be recurring favorites. It all sounds great and everything, but it’s just not for me. I’ll happily tell a story, snuggle in a blanket and sing a song next to a roaring fire inside a mountain cabin and nibble on homemade baked goods instead. Today I’m sharing my version of a jazzed-up stay-at-home camping treat- these Peanut Butter- S’Mores Turnovers. 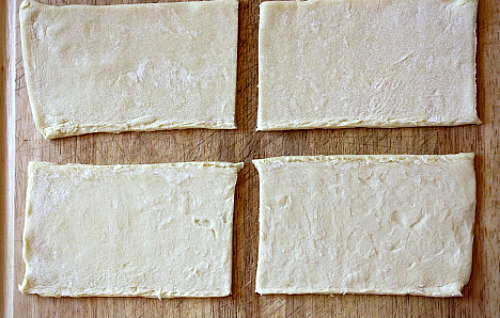 Thaw out a box of Puff Pastry, and cut along the fold lines to make 6 large rectangles. Cut each rectangle in half lengthwise. Layer 1/4 of a whole graham cracker, a piece of milk chocolate bar and a spoonful of peanut butter on one side of the Puff Pastry. Wet the edges with water (dip your finger in water and gently touch along the edge), fold over the filling ingredients and press edges together. Use a fork to seal the edges. Repeat with remaining pieces. 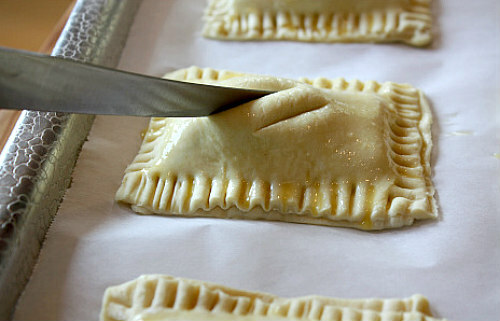 Transfer filled turnovers to a parchment-lined baking sheet, and brush with egg wash.
Use a sharp knife to cut a couple of slits in the top of each turnover (to allow steam to escape while baking). Bake the Peanut Butter S’Mores Turnovers at 400 degrees F. until golden (about 15 minutes). Scoop marshmallow creme into a zip baggie and microwave it for about 8 seconds. 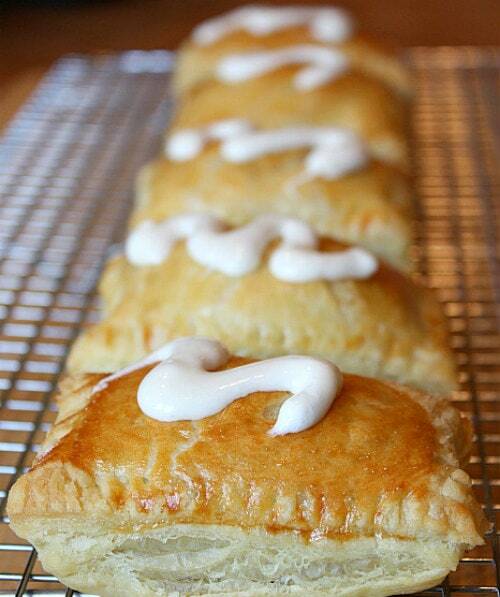 Snip the tip of the bag, zip it and drizzle marshmallow on top of warm turnovers. 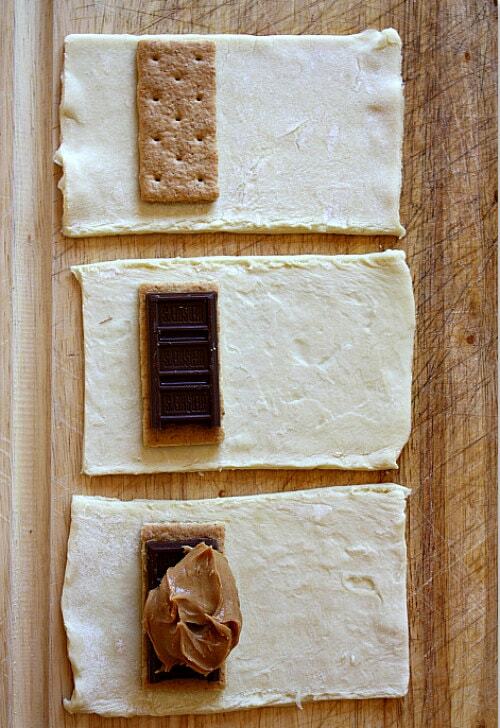 Here are the Peanut Butter S’More’s Turnovers- deconstructed! 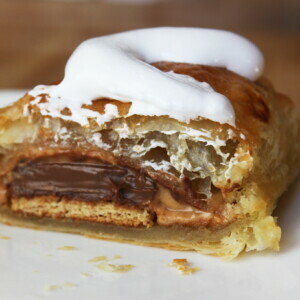 The Puff Pastry gives the S’Mores an elegant touch, and frankly… they’re a lot easier to eat tucked inside of a turnover. I think the picture above pretty much explains how this delicious dessert turns out. If you’re a chocolate + peanut butter lover, you’ll be a big fan for sure. 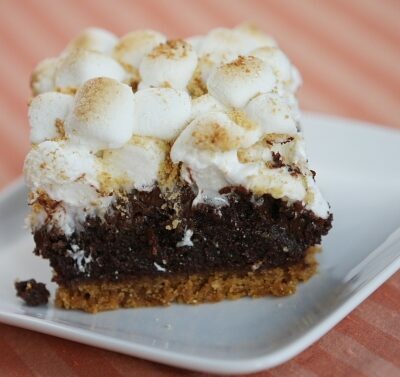 Hint: Save a few chocolate bars from your kid’s Trick or Treating loot to bake up a few of these S’More’s treats! 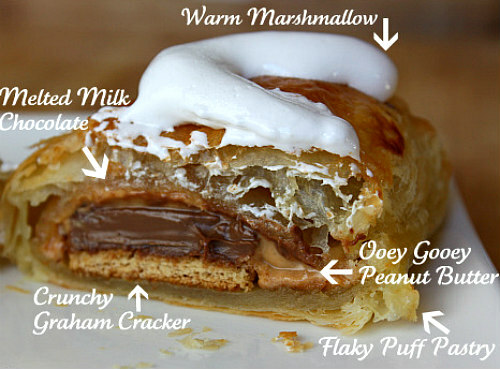 A delicious mix of peanut butter, chocolate and marshmallow baked into a flaky puff pastry! Preheat the oven to 400°F. Line a baking sheet with parchment paper or spray with nonstick spray. 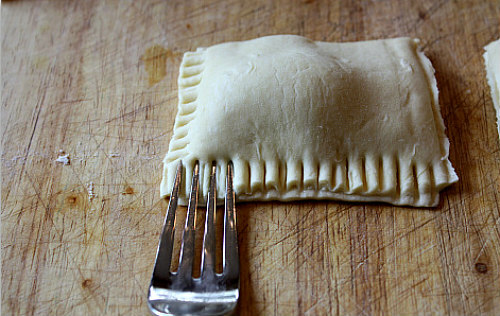 Lay the Puff Pastry on a cutting board. Working with one sheet of Puff Pastry at a time, cut on the three folds, creating 3 rectangles (about 3" x 10" each). Cut each 3 x 10 rectangle in half. You'll have 6 pieces to work with for each sheet of Puff Pastry. Lay a graham cracker on 1/2 of each square, top with chocolate that has been cut down to match the length of the graham cracker. Scoop a scant 1 tablespoon peanut butter on top of each chocolate bar. Working with one turnover at a time, wet the edges of the Puff Pastry and fold (over) in half to meet opposite edges. Gently push the edges together to stick; use a fork to seal the edges together and create a ridged pattern. Repeat with each turnover until all are sealed up. Gently move the sealed turnovers to a baking sheet with a small spatula. (At this point, the turnovers may be refrigerated for up to an hour before baking- cover the baking sheet with plastic wrap- when ready to bake, remove from the refrigerator and continue with the instructions). 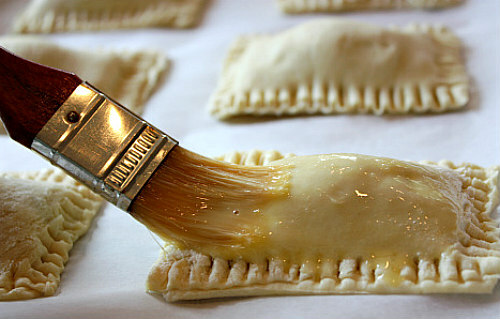 Brush the turnovers lightly with egg wash, then use a sharp knife to cut two small slits into the top of each turnover. Bake for 15 minutes, or until the turnovers are puffed and golden. Remove from the oven. Let cool for 5 minutes. Scoop the marshmallow creme into a zip baggie (don't zip). Microwave for 8 seconds to soften. Zip the bag and snip a small piece off of the corner of the bag. 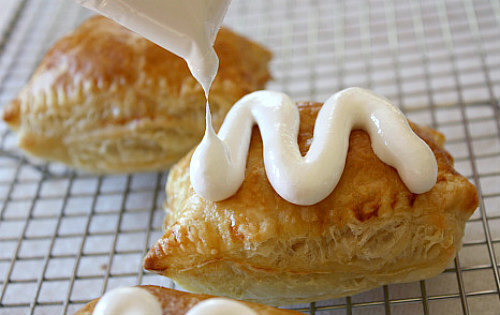 Drizzle marshmallow onto the top of each turnover. Serve immediately. *Marshmallow Creme (also known as "Fluff" in some parts of the world) comes in a jar and is usually found in the baking aisle near the marshmallows. 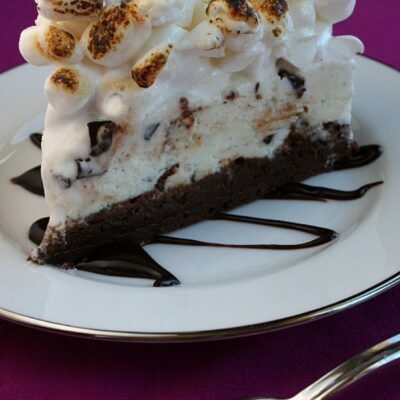 *I tested this recipe with real marshmallows and they didn't work as well as the marshmallow creme. 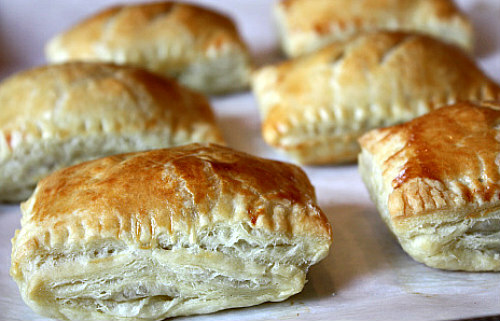 *This recipe can be easily cut in half- just thaw out one sheet of Puff Pastry. *These are best served while warm & gooey, but they can certainly be eaten any time! Note: This recipe was originally created in partnership with Pepperidge Farm Puff Pastry. I am going to make these for my son. He has a Peanut Allergy, so I will be using Sunbutter instead of Peanut Butter. I can’t wait to try this, maybe even with nutella vs peanut butter. Thanks and I agree with you on the camping, although I did camp in my younger days. What a delicious twist! Thanks for sharing! Can’t WAIT to try these on our camping trip this weekend! With SunButter, since that’s my “other” gig. Thanks for the inspiration! I just added this to my recipe binder. Brilliant! GENIUS!! 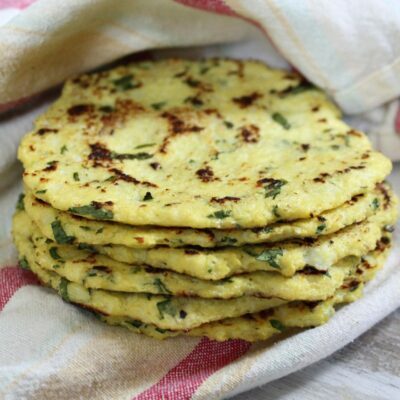 They’re simple, beautiful and probably downright delicious! 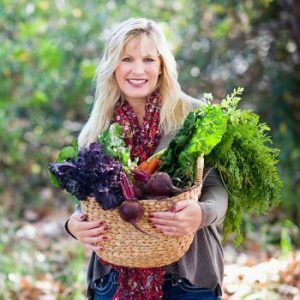 Thanks for sharing such a fun recipe! I made these for my boyfriend and he loved them. We both love smores AND adore peanut butter so I knew we would certainly love these. I had never used puff pastry before either but it’s not that intimidating once you start handling it. 🙂 Well worth the very first purchase/usage of puff pastry. I’m going to make them again soon. I just made this last night. They were fantastic. My puff pastry didn’t look quite as good but they were still the tastiest thing I’ve ever had! 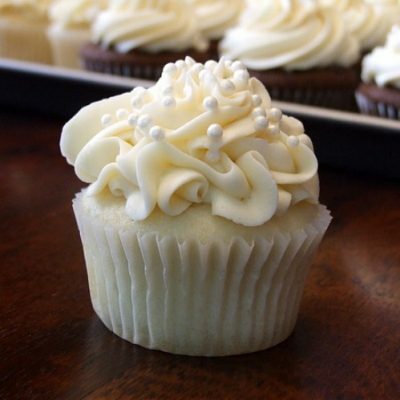 I just made these last night and they are delicious! The only thing I would do differently, if you want more of a s’mores feel than a peanut butter feel, is to do just a smidge of peanut butter and add an extra gram cracker. Yum! Oh. My. Gosh…. these were SO good! I just made them! I made them a little smaller, then baked half and put the other half in the freezer! I made these the very day I saw them. They were AMAZING and I have already had friends make them as well since they tasted/heard about them. I am addicted. I could do these! They look great! 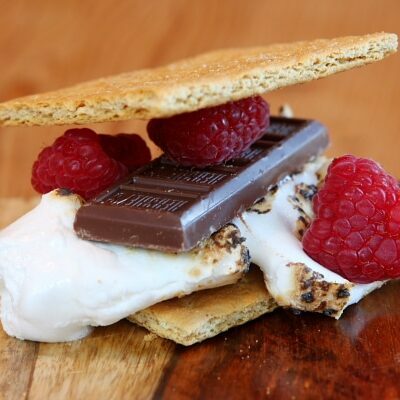 you are the only person, besides myself, that I know who puts peanut butter on their s’mores. Everyone else has been missing out! I’ve been asked to make food for a sumptuous dessert buffet for Havdalah & student tile mosaic dedication at our Temple Nov 14th. 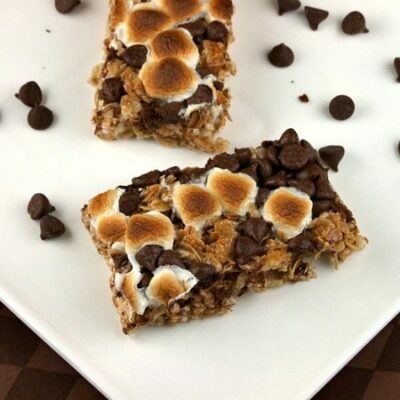 This TREAT will be perfect for the Kids Activity! Heavenly! 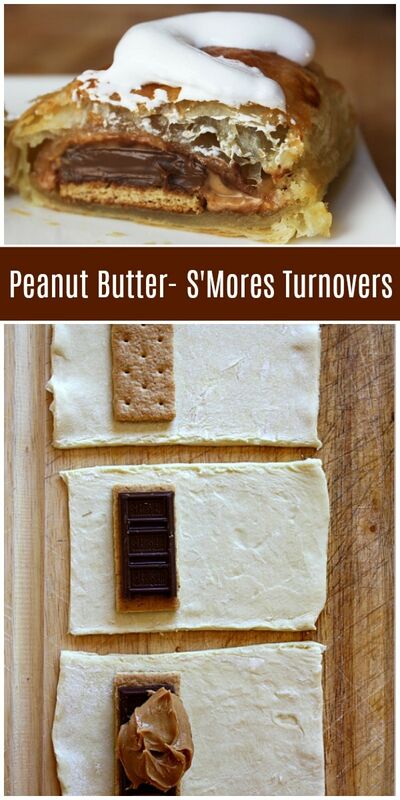 Yes, we are chocolate and peanut butter fans and this would be a great recipe to involve the kids!